It was indeed a special moment when Caressa & Jianna fashion labels from Zenitex launched their collections at a dazzling fashion show at St Andrews Auditorium in Bandra, Mumbai. 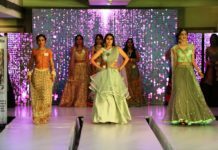 The magnificent annual fashion show ‘Colour Power 2018’ was organised by NIIFD (National Institute of Interior and Fashion Design). The highlight of the show was the introduction of designer Sonali Viral Desai and her daughter Jeeya Desai to the fashion world with the launch of their brands Caressa and Jianna that work around the concept of ‘Fashion for a cause’. Sonali along with her daughter Jeeya was inspired by the social work done by her husband Viral Desai, a noted philanthropist and entrepreneur from Surat. Viral Desai who is CEO of Zenitex, also heads Hearts@Work Foundation which has worked for many cancer check-up camps and ‘Clean India – Green India’ tree plantation drives. The mother and daughter duo decided to contribute towards Viral’s cause which gave birth to these fashion labels as a percentage from every product sold by these labels will directly go to Charity and Tree Plantation equally through the Foundation. It was indeed a rare sight when a 12-year-old girl walked the ramp for the Mumbai based fashion designer Namrata apart from launching her own label. 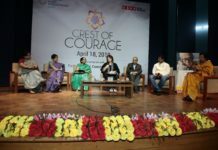 Moreover, her father Viral Desai, was honoured and invited to the show as a guest of honour along with famous personalities like Vikram Phadnis, fashion designer Archana Kochar, and Dr. Anjani Prasad, MD of Archroma. 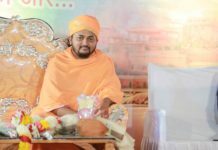 Viral Desai is a well-known figure with an array of national and international awards and achievements in his name. The label was born out of the urge to help the Hearts@Work Foundation and follow the philosophy of Zenitex which says, ‘A business that makes nothing but Money is poor business ’. He believes in philanthropy business model of giving back to society on the footsteps of organisations like Tata Group was pleased and overwhelmed with the efforts of his wife and daughter.